Kidderminster Harriers FC today announced that the popular midfield player Russ Penn has penned a new contract with, unusual for us, a long length. Lasting up until April 2011 the new contract makes our longest serving player ours for another 2½ years but that will only be untill another team comes in for him and then it'll mean a decent payday to buy his contract out. This season his form has been somewhat disappointing with some below par performances and only slight glimpses of what we know he is capable of. This is thought to be down to the touting around of his body by the board during pre-season when they wrongly linked Walsall with him and Walsall then made their feelings known about the reverse tapping up to the press. 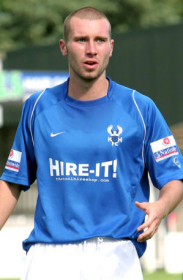 The next club he was linked with was Peterborough and for a time this had some credence when the Posh manager Darren Ferguson was seen at a couple of our games and then soon after their Director of Football, the infamous Barry Fry, was seen talking to the equally infamous Barry Norgrove at Grays. Nothing eventually came of that either and it all went quiet again but Russ' form still didn't return. Now with his future sorted we might get the player that scored four times at Halifax last season back with us in spirit. In other news today was the possible pairing with either Ilkeston Town or Ossett Town in the next round of the FA Trophy. First we have to get past Burscough tomorrow evening if that game is on. After the original game was called off on Saturday morning due to a waterlogged pitch it could now be in doubt through either fog or frost and even both. The omen of frost forming at 3:00pm this afternoon and car windows being scraped at 5:00pm on leaving work doesn't bode too well. My preview from Friday is still valid and that can be found here rather than me wasting time re-writing it again. The final bit of news is that the Crawley game that was postponed because of our visit to Coventry on January 3rd has now been re-arranged for March 10th at Aggborough with a 7:45pm kick off.